Bhopal Development Authority again invites applications for the allotment of residential plots under BDA New Freehold Plot Scheme 2016 at Lakshmi Narayan Sharma Aero City Phase-I. Under the scheme the authority has offering 313 freehold residential plots for all segments of the society. Under the scheme total, three types of residential plots are being offered by the authority which are available in the sizes of 2324.16 square feet, 1452.6 square feet and 600 square feet. Registrations for the allotment of these freehold residential plots has been started from 4 August 2016 and interested people can avail the benefits of scheme till 27 August 2016 by applying through offline and online mode of registrations. How to Apply: Applications for the scheme can be filled through offline and online mode within the registration period. Cost of applications form for offline registration is Rs. 500/- while in case of online registration, the applicants will have to pay only Rs. 250/- as applications cost. 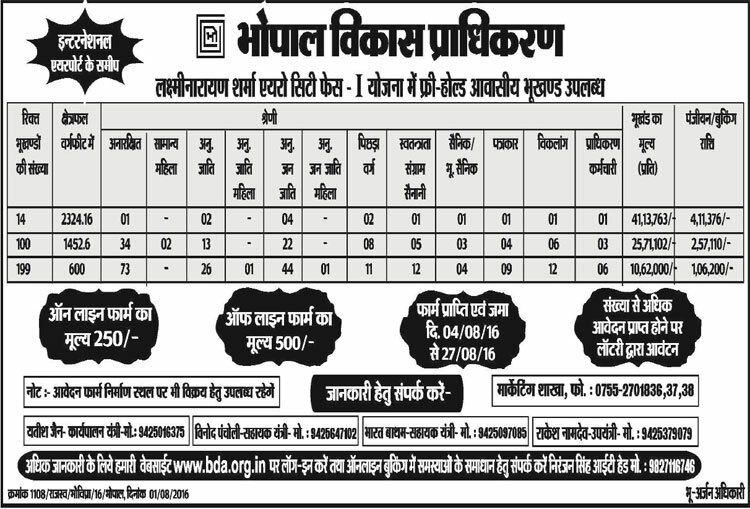 For more details visit the official website of BDA Bhopal.